As someone who grew up in the harbour town of Stornoway, I've been going out in angling boats sinceI was about eleven years of age. 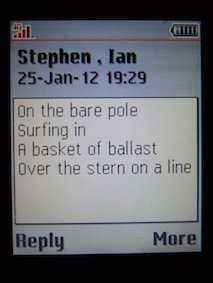 I took to sailing as a student, back home in the summers. My first boat was a basic plywood catamaran. Later I was to work my way through traditional lug-rigged boats, dinghies and yachts while employed by the Coastguard Service, in Stornoway, latterly serving as as a Senior Watch Officer. 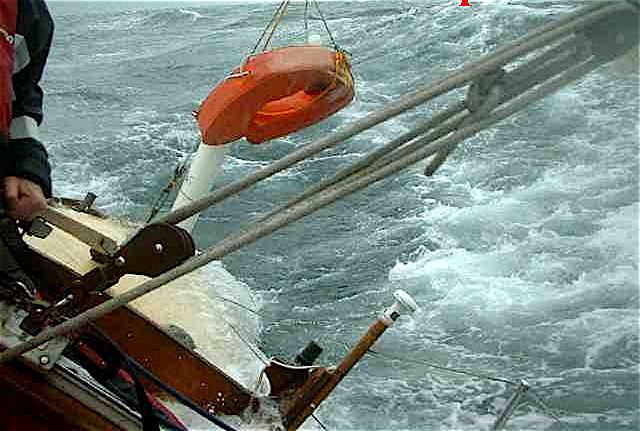 I gained the RYA/MCA Yachtmaster Offshore certificate of competence in 2003. Later, I was to complete a Cruising Instructor's assessment and the Ocean Youth Trust's mates and skippers course. After some years which included a few delivery trips, some formal teaching and a regular position as mate on an ex BT Challenge yacht, I'm now continuing to explore the cruising territories between Shetland and Ireland along with my wife, the visual artist, Christine Morrison. We also both volunteer with Falmadair (tiller) to help keep traditional craft of North Lewis alive by sailing them. 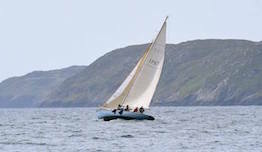 And this is her sailing, after her refit, in an annual challenge which sails the route of the historic race of working boats, out of Stornoway – the 1902 Coronation Cup. The photo is by Chris Murray. A passion for the sea has been a motivating force behind poem, stories, plays, radio broadcasts and visual arts projects for many years. In 2003 I was invited to contribute a web-based work as part of Zenomap, Scotland's first presence at the Venice Biennale. I was able to navigate the route of a traditional story which links Sweden with the North of Scotland and re-tell the story as a series of messages from a satellite phone, transmitted from Shalimar 2, along the way. These appeared on a computer terminal at the 50th Venice Biennale. 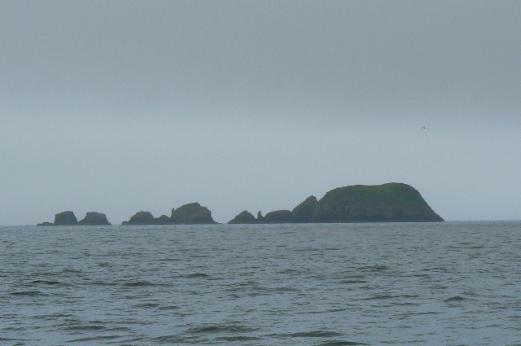 The Shiant Islands (taken from the yacht Elinca) in an image used as the basis for a photo-polymer print by Emmanuelle Waeckerlé where the image is recomposed in Ian's text of the Aleinn Duinn story, which relates to this setting. 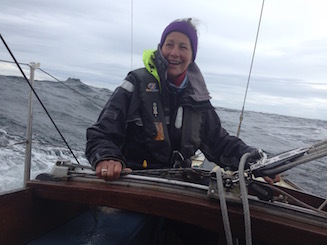 From around 2010 the emphasis has shifted from commercial sailing to volunteering as a skipper with Falmadair,(tiller), the charity which maintains and sails traditional lugsail craft of North Lewis and cruising El Vigo with Christine Morrison. Several expeditions have been celebrated in Waypoints. 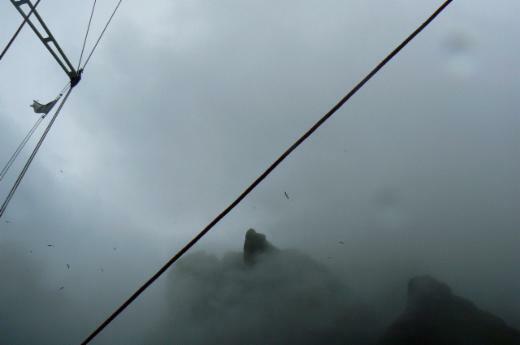 This image, a still from a video by Norman Chalmers, catches our beat through Hoy Sound,in a bit of weather as a finale to our attempt to sail El Vigo from Stornoway to the StAnza festival in March 2004. 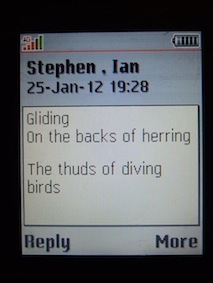 The voyage produced a sequence of poems, as a log. One is now set to music and sung by Kirsty Law. Commercial sailing tasks have included working as mate on the 67ft Challenge yacht Elinca and delivery of a 53 ft Hallberg Rassey yacht from Norway to Stornoway. I've also made many successful delivery trips of small yachts in the west coast of Scotland area. The experience is filtering through to non-fiction projects which counterpoint factual accounts of voyages with traditional stories. It's looking like a third volume of voyages and stories is shaping up, to follow Waypoints and Transits. 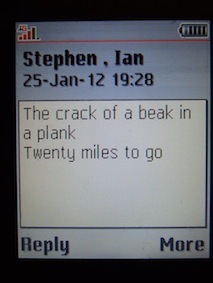 A working title is Sailed and Heard. "No passage even for boats" - a gap between Boreray, St Kilda and an outlying stac from Elinca. Ian's image of a charted route in the Sound of Soay and a Gaelic version of a St Kildan story (made with Maggie Smith) have also been used as the basis for a text drawing by Emmanuelle, printed by John McNaught at Highland Print Studio. As one of a team of volunteer skippers with Falmadair (North Lewis Maritime Trust) I take out many groups to allow them to experience traditional North Lewis lugsail vessels. Normally we make short inshore trips. From time to time we mount an expedition. 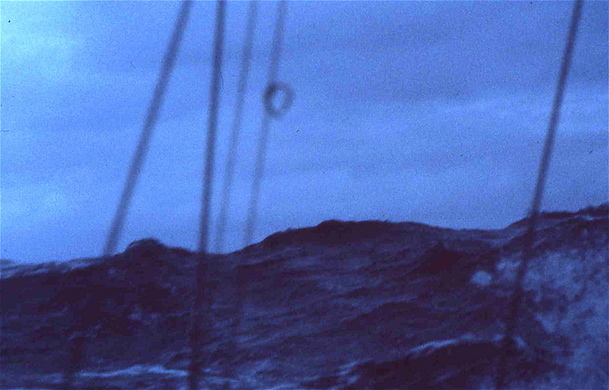 This is taken from sgoth Jubilee, about five miles out from Cape Wrath. I also managed the renovations of sgoth Jubilee (1935) and Broad Bay (1912) as part of the Sail Loft project in 2006. In 2016 to 2017 Falmadair managed the renovation of the 17ft Callicvol. Broad Bay was completely rebuilt by Iain Louis Macleod and Jubilee and Callicvol were restored by Mark Stockl. A new sail for Callicvol was funded by Stornoway Port Authority. 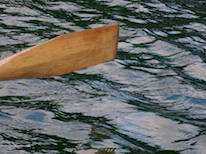 A yard and set of oars, in Douglas-fir, were made by club member John Mitchell. 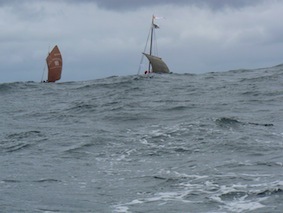 Back in 2008, I managed the preparation of the 33ft an Sulaire for open water sailing and skippered on her passage from Stornoway, round the top of Scotland, to join the Moray Firth Flotilla. 2010 was the year sgoth Jubilee turned 75 years of age. A team of us sailed her home to Port of Ness. 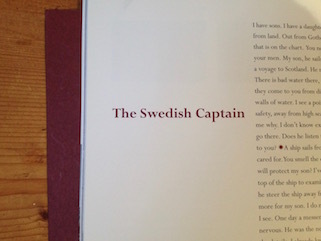 As the last sailing sgoth Niseach to visit Sula Sgeir, she was sailed back to that Island, with the writer Robert Macfarlane aboard. After returning to Ness, another group joined me to sail on to Stromness, Orkney. We formed links with the Orkney Yole Association before a return voyage to Stornoway in October. The Sula Sgeir voyage is documented in Rob's book The Old Ways, to follow an account of our journey to the Shiants in the 18ft Broad Bay. 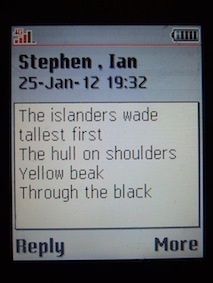 My own accounts of navigating both Jubilee and Broad Bay form part of Waypoints. Westray to Fair Isle, June 2010 - my image from a voyage crewing on the 28ft Hereshoff design Spirit of Rema for Edward Anker. I joined Ed in Stornoway and helped take the small yacht on to cruise Shetland. Our route included Baltasound and Outskerries. 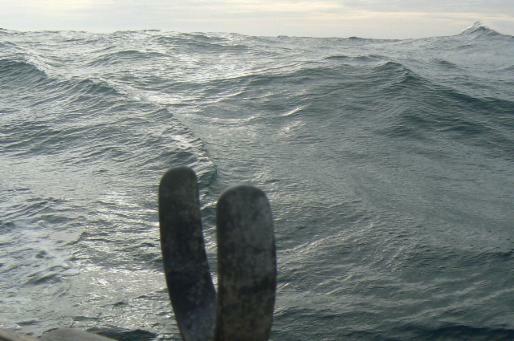 Ed went on to take his vessel single-handed to Norway and back and continued on his attempted solo circumnavigation. The voyage is one of many which will feed into non-fiction works - the retelling of traditional stories alternates with a log of navigating their settings. El Vigo, the33ft Robert Clark design, has taken part in many arts projects. Her own voyages have included a transit of Limfjord in Denmark and a non-stop North Sea crossing from Thyboren to Stornoway via the Pentland Firth. A detail of the chart used for the limfjorden passage, and a retelling of a story from that area, was the basis of a third photo-polymer print made with Emmanuelle Waeckerlé and Highland Print studio. The story was told to Alex Patience who responded with a version in Doric. These voyages will be fully described in Transits, my 2nd work of non-fiction. Many of these voyages have led to experiences which have fed into my non-fiction projects - these have been developed thanks to a Creative Scotland Bursary 2014 – 15.